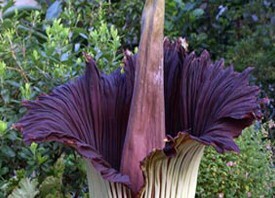 Hundreds of people turned out on Easter Sunday to get a whiff of a flower that smells like rotting flesh. Officials at the zoo in Hilo told the Honolulu Star-Advertiser that the "corpse flower" smells like rotten meat that has been sitting out for a while. The flower is on loan from an anonymous donor. It arrived in mid-April and began emitting its unusual smell Saturday. In its Indonesian homeland of Sumatra, the flower infrequently emits its smell to attract carrion beetles to what they believe is rotting flesh. The beetles move from one flower to the next, pollinating them in the process. But without other flowers of its kind or beetles, a botanist stepped in and used pollen imported from New York.